7.5t trucks / lorries are popular with businesses and people who are looking for a van to rent for larger house removals. They offer a much bigger load space and payload than Luton vans but can still be driven on a car licence by many people. For more key facts on 7.5 tonne box van hire click here. Driving licence requirements: You need category C1 on your driving licence. If you passed your car test before 01/01/1997, you should have category C1 on your licence. If you passed your car test after 01/01/1997, you won't have category C1 and will need to take an additional test to gain this category. Minimum rental age: 21 is the lowest possible age - some companies will have further restrictions. Admiral's 7.5t lorries are 20ft box vans with 1 tonne tail lifts and a payload of 2,900kg. They are ideal for large DIY house moves. Admiral Van Hire is based in Walsall, just north of Birmingham and adjacent to Junction 10 of the M6. 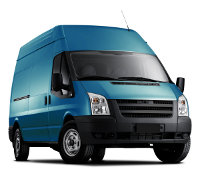 We're seeing high demand for 7.5 tonne box van hire. Include your company here with location and vehicle details for ONLY £75 a year. Payload (maximum load weight): Usually around 2,800kg for a 7.5 tonne box van (lower with tail lift, as the tail lift itself is heavy). Fuel Consumption: Depends on model and weight of load, but probably 15-20mpg. *Although these speed limits remain valid, goods vehicles over 3.5t now have speed limiters fitted limiting their maximum speed to 56mph. Other Notes: Drivers who have taken their car (category B) test since 01/01/1997 will not have category C1 (7.5t) entitlement on their driving licenses. If you are in this position, you will need to take a separate category C1 test before you can drive 7.5 tonne trucks legally on public roads. If you are using a 7.5t hire truck for commercial use, you will be required to keep a record of your driving activities using the vehicle's tachograph and will probably need an operator's licence. This is not required for "non-commercial carriage of goods for personal use" - i.e. moving house for yourself. This is not a definitive statement of tachograph rules and driving licence regulations - please check with DVSA or the DVLA if unsure.